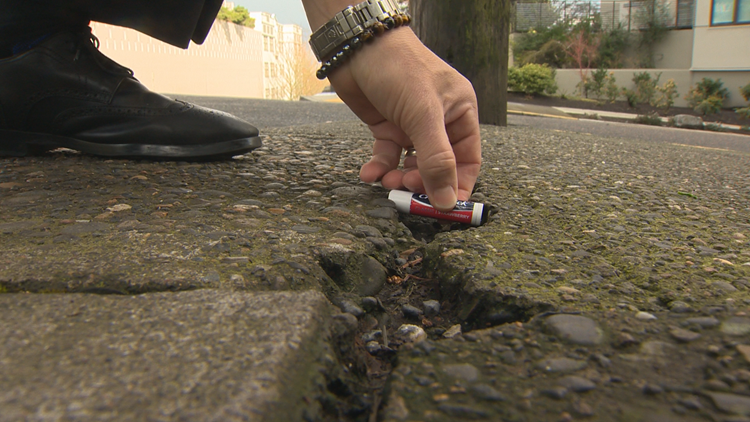 PORTLAND, Ore. — A Portland man is facing thousands of dollars for "sidewalk repair" charges for what he says were unnecessary fixes. Homeowner Kyle Bell says his sidewalk was fine - no tripping hazards, no large cracks and no dips. But the City of Portland deemed it to be a hazard and that it had to be repaired. The total cost of the project was $7,321. So the Portland Bureau of Transportation hired a crew to do the work and sent Bell the bill. Sidewalk repair in Portland is complaint-based. But no one complained about Bell's sidewalk in Southeast Portland. Instead, someone complained about the sidewalk elsewhere on the street. But PBOT’s policy is, once it gets a complaint, it inspects the entire block-face to see if anywhere else is a problem. Bell said the fact that no one complained about his sidewalk makes it even more frustrating. That “half-inch” marker that Bell is talking about is the PBOT standard. If a sidewalk has a half-inch gap, lip or dip, the city considers it a code violation. But when PBOT fixed it, it also billed Bell for work that wasn't even on his property. 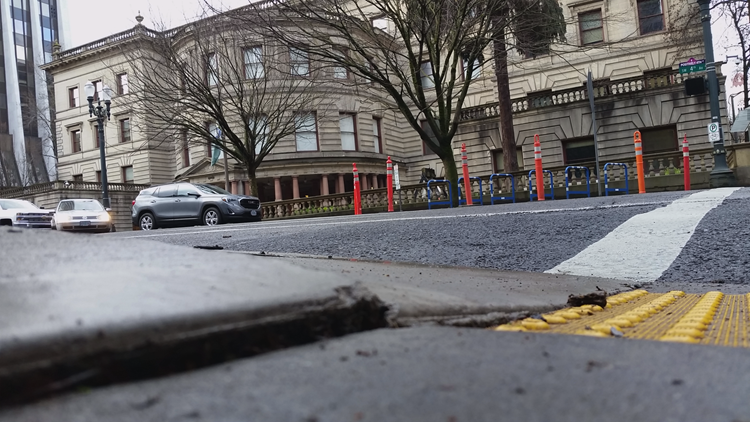 In addition, PBOT also required Bell to replace the cracked curbs along his sidewalks. And that would include shutting down lanes of traffic, hiring flaggers and jackhammering down more than a foot deep into the streets. But when he questioned the inspectors, they decided the curbs were adequate. His bill was reduced for PBOT’s mistakes, but the total was still nearly $5,000. So Bell appealed to the city council, the first Portland homeowner in 20 years to do so. PBOT presented its case, showing a picture of the violation that was not on Bell's property. It wasn't even his sidewalk. The PBOT picture showed trees pushing up the sidewalk. Bell's sidewalk doesn’t have any trees. 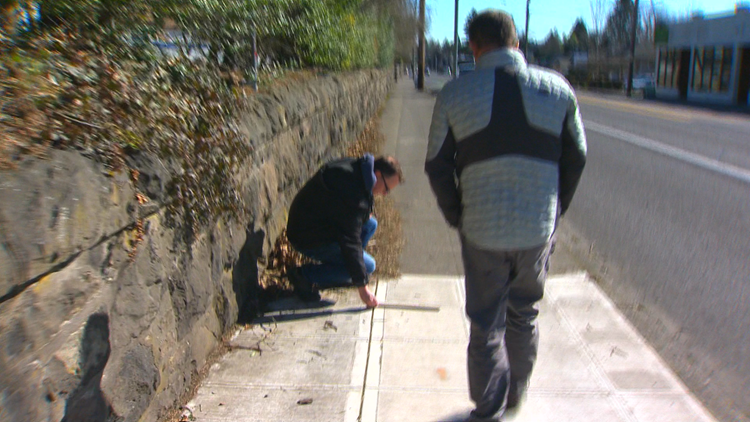 But as PBOT was making its case in front of the City Council against Bell, using the half-inch standard as a hazard that can result in ‘trips and falls’, KGW checked out some city-owned property to see if PBOT was following its own standards and guidelines. It didn’t take long. Because just up the street from Bell's sidewalk is the Mount Tabor Parks Department, a property that belongs to the City of Portland. The sidewalk in front of that property was not only a violation of the city’s code, it was much more severe than Bell’s sidewalk. The city property has tripping hazards and would be difficult for anyone using a wheelchair to navigate safely. In addition, down the street from Bell's place, KGW found city-owned sidewalks in front of a school that were lifted by several inches. They appear to be obvious city violations that would qualify as a ‘trip and fall’ hazard by PBOT’s definition. In fact, the city-owned sidewalk in front of Portland City Hall in downtown Portland also appears to be a clear code violation by city standards. During the appeal hearing, Kyle testified about the condition of his sidewalk, and said the repair work was not needed because his sidewalk was safe. PBOT’s website states, ‘partial square replacement on a sidewalk will not be done.’ But when PBOT crews fixed Bell's sidewalk, they left him with several ‘partial triangles,’ and one in particular that already appears to be violating code. Despite the apparent discrepancy in the work performed, PBOT billed Bell $4,825 for the repair work. During the appeal hearing, Commissioner JoAnn Hardesty asked PBOT manager Wasiak about the apparent subpar repair work. “It looks like it's sticking up more now than when it was when he was told that he had to repair it. What's the city's response when the repair is inadequate?" Hardesty asked. Ultimately, the commissioners ruled against Bell. Hardesty was the only commissioner to rule in his favor. He was ordered to pay $4,825 for the sidewalk repair work. “It's tough to fight City Hall," Bell said. When the City of Portland uses one of its contractors to repair your sidewalk, you are required to pay for it, but PBOT offers a three-year guarantee on the concrete work. Homeowners can do the work themselves or hire a contractor but will need a permit and have to comply with all city codes. Bell said these options were never mentioned to him. PBOT admits ‘sidewalk improvement’ is not a perfect science, and that these options need to be clearer to homeowners. Agency officials said they are working to improve their policies. Editor's note: In the video above, a bill for the homeowner is said to be $4,285. As the graphic on the video correctly notes, the actual amount is $4,825. It boils down to this: City leaders in Portland use a specific set of guidelines to determine whose sidewalk is dangerous and whose is safe. City commissioners and Bureau of Transportation leaders all know those guidelines, and there's not much "wiggle room" when they order repairs and bill the homeowners for the work. But city leaders also want everyone in Portland to be proactive and fix their own dangerous sidewalks to keep everyone safe. But does this program apply to everyone equally? PBOT’s commissioner, Chloe Eudaly, also ruled against Bell’s appeal. “Today, we have to use the rules that are in place," Eudaly said. Is the sidewalk repair system in Portland "uniformly enforced across the city?" Does every Portland homeowner play by the same rules? There appear to be variations in enforcement. 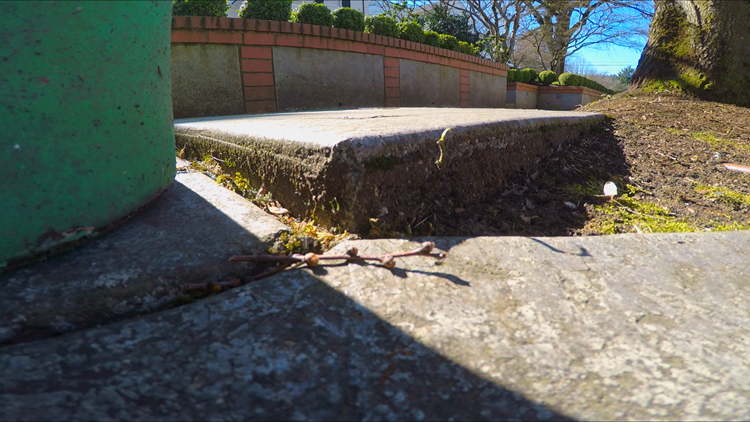 When KGW went to Mayor Wheeler’s home to look at his sidewalk, we found a ‘tripping hazard’ that is not only dangerous, but an obvious violation of the city's ‘half-inch’ standard. Mayor Wheeler also told us there is a tree near his home that pushes up a portion of his sidewalk. He’s had it repaired before, and will now repair it again. However, the sidewalk in front of Commissioner Eudaly's home is markedly uneven. Eudaly rents her home, but as the head of the Portland Bureau of Transportation, she knows as well as anyone that her sidewalk is a violation. And she knows how to report it. One call or email to the agency she oversees could lead to repairs, but that could prove expensive for the property owner. Her office did not respond to a follow-up question as to whether the apparent violation in front of her residence had been reported. “Right in front of her house does seem really ironic and hypocritical, that's really disappointing," said Bell, the homeowner who lost the appeal on his own property. At the sidewalk in front of the house of the man who runs the entire "sidewalk-repair-inspection-process," PBOT Interim Director Chris Warner, that sidewalk stretch also seemed to be outside of city code. 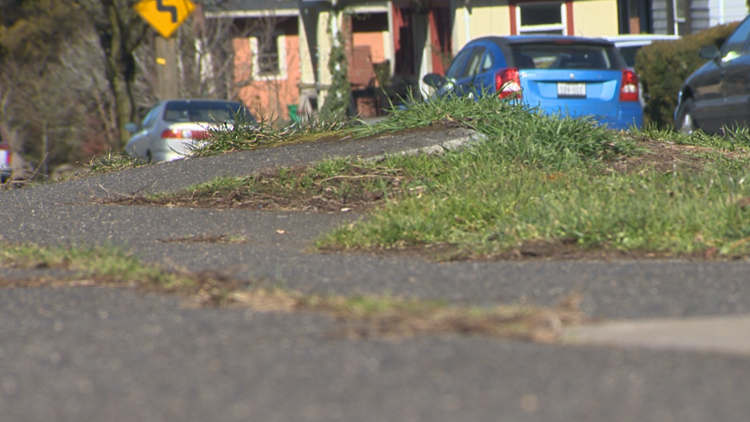 The city code is clear that Portland homeowners are required to keep their sidewalks in good shape, a point that Kyle Bell wishes would apply to city officials as well. “I'm as subject to the laws and ordinances as anybody else. It’s on me, it’s my responsibility and I need to get it done," said Wheeler, about his own apparent violation.